The crisp smell of ginger and spice will fill the air as the greatly anticipated Jolly Days Winter Wonderland opens its doors. Elves rappel from the rooftop to greet Santa as he zooms to the museum in a real race car to kick off the festivities. It all begins at 8:30 am. Join families as they wave to Santa and his sleigh-driver, Ed Carpenter owner of the #20 Ed Carpenter Racing IndyCar provided by Indy Racing Experience. Arrive early and grab a yummy treat from Gingerbread Café or a free cup of creamy, hot cocoa from the plaza. Don’t forget to chat with cheery elves before the big show! The fun doesn’t stop there—meet the Chorduroys singing group inside for a holiday sing-along to usher Mr. Claus down the festive red carpet to the 47-foot-long Yule Slide! One lucky member child will get to accompany Santa on a fun ride down the Yule Slide to mark the opening of Jolly Days. 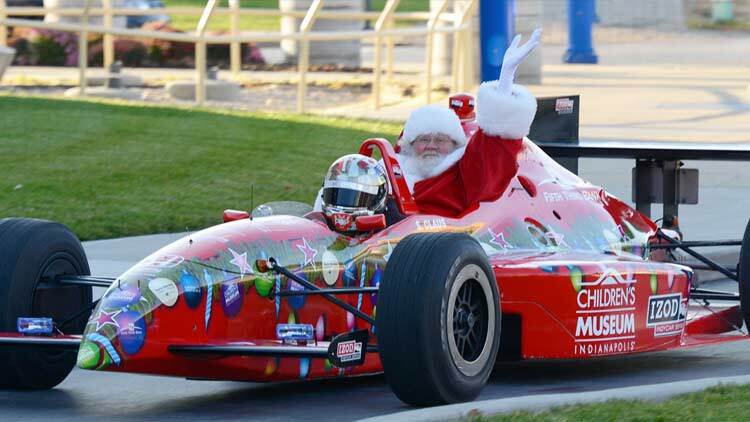 Meet Ed Carpenter, driver and owner of the #20 Ed Carpenter Racing IndyCar—and Santa’s chauffeur—on this festive day! Ed will be signing autographs on Level 2 on the Mezzanine for one hour during the holiday celebration. Don’t miss him before he races off to his next adventure! The Museum Store Discount 8:30-10 am only. Santa’s good little shoppers can save big bucks! The Museum Store will offer a 30 percent Black Friday discount on all purchases made before 10 am. Free Holiday Craft 8:30-10 am. The tradition of ringing bells during winter holidays is thousands of years old. Bells make a happy sound and are enjoyed in “ringing out the old and bringing in the new” each season! Customize a bell with different colors of ribbon to make it your own unique instrument to celebrate the holidays. A Visit from The Snow Queen (A fun, loose adaptation of the fairy tale by Hans Christian Anderson). When her best friend is kidnapped by the evil Snow Queen, 12-year-old Gerda goes on a quest to rescue him. With the help of a troll and an elf, find out if Gerda be able to find her friend before his heart freeze forever? Holiday Dinner Theater. Experience the holiday theater show, The Snow Queen, from the best seats in the house! Then have a buffet dinner, meet and greet the actors, and enjoy a special musical performance by The Mistletoes. Jolly Day’s and the Yule Slide will be open exclusively for from 5-6 pm. Gift Memberships 8:30-10 am. Give a gift for all ages that lasts all year! 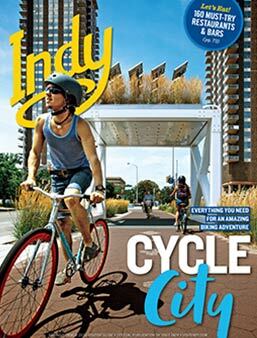 A membership to The Children’s Museum of Indianapolis lasts for a year—and the memories last a lifetime! Who knew a year of fun could fit into a stocking?